This is a video of Norris Dam spilling from the top spillways in 2011. It's exactly the big spill that everyone has been waiting on. TVA doesn't open the spillways every day. Sometimes, 10 years will go by between these big spills. Seeing the rushing water reminds me of visiting Niagara Falls a few years ago. It's a massive display of raw power at its best. 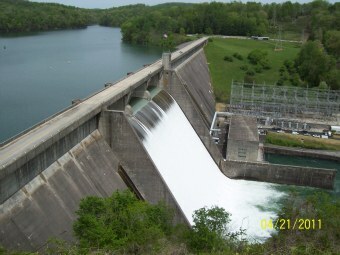 The Smaller sluice gates are at the bottom of Norris Dam open more frequently that the top spillways. They can still be fun to watch even if they don't draw large crowds. Here are some photos that were taken during a smaller spill at Norris Dam. Visitors who want to camp overnight should consider staying at the East Area of Norris Dam State Park. As the photo shows, the park also has cabins, a picnic area and campground with hookups. At this end of the dam is a small visitor center with facilities and a good sized parking lot. This video of the spillways that are open on Norris Dam gives you an idea of the amount of energy being discharged. It's an awesome sight. The parking lot near the East Area gives a good view of the top of the spillways. Visitors can park in this lot to walk across the top of the dam. The sidewalk at the parking lot also gives a pretty good view. Photos that appear on this page were taken there. Want to know why there's a teddy bear in the photo? Click the Where Bear Traveled link in the side bar on this page. It will explain what he's doing at Norris Dam and why he appears in lots of our photos. For more articles and videos by this blogger please visit www.youvebeenreviewed.net.